How do I calculate my Medicare Part D Late-Enrollment Penalty? 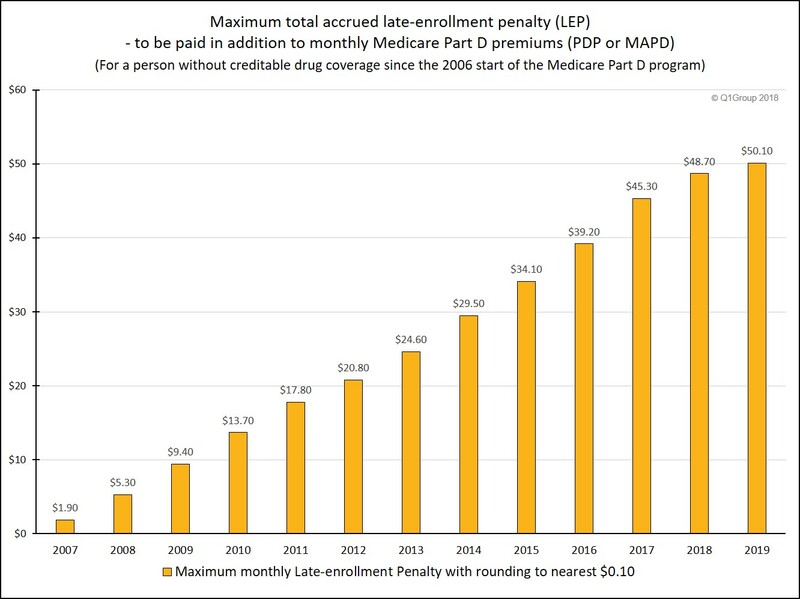 Question: How do I calculate my Medicare Part D Late-Enrollment Penalty? Answer: Your Medicare Part D late-enrollment penalty is calculated as the number of months you are without some form of "creditable" prescription drug coverage multiplied by 1% the annual base Medicare Part D premium (for example, $33.19 in 2019 and $35.02 in 2018). Not a big fan of math? No problem. The amount of your Medicare Part D late-enrollment premium penalty is calculated each year by the Centers for Medicare and Medicaid Services (CMS) and then reported by CMS to your Medicare Part D plan or Medicare Advantage plan. Your Medicare Part D plan will then send you a letter regarding the amount of your penalty. So, CMS or Medicare will calculate your Part D Late Enrollment Penalty by totaling the number of months you have been without "creditable" prescription drug coverage and multiplying the total months by 1% of the national base average Medicare Part D premium (this changes each year). The letter from your Part D plan will also detail how CMS calculated the penalty and explain how you can ask for a review of your the Late-Enrollment Penalty (or LEP). "Creditable" prescription drug coverage means drug coverage that is at-least-as-good-as basic drug coverage provided by a Medicare Part D plan. If you have employer drug coverage, your employer health plan administrator will have sent you a letter telling whether your drug coverage is "creditable". You can click here to read more about how CMS calculates Medicare Part D late-enrollment penalties. 2019 Example: How do I estimate my five-year late-enrollment penalty? As shown in the table above, the 2019 national base Medicare Part D premium is $33.19. So, if you were previously without creditable prescription drug coverage for five years (or 60 months), you would pay, in addition to your monthly Medicare plan premium, a 2019 monthly penalty of $19.91 (60 x (1% x $33.19)) - or an additional $252 per year. Using this same example, you would have paid a 2013 monthly penalty of $18.70 or about $238.92 per year. Who will pay a late-enrollment penalty? If you did not enroll into a Medicare Part D prescription drug plan during your initial enrollment period (IEP) and you did not have other creditable prescription coverage (like VA or employer benefits), you could be subject to a penalty that is added to your monthly Medicare Part D premiums. In addition, if you canceled your Medicare Part D plan or were without creditable prescription drug coverage for more than 63 days, you will also be subject to the premium penalty. How can my late-enrollment penalty increase over time? For more information, you can click here to review our recent Blog articles detailing the late-enrollment penalty. You can also click here if you would like to review more of our Frequently Asked Question (FAQ) regarding the Medicare Part D late-enrollment penalty. Remember, not everyone is subject to the Late-Enrollment Penalty. CMS provides that there will be no Late Enrollment Penalty "for any beneficiary eligible for the low income subsidy" or Extra Help program.